I see the rest of the cattle tested around Bridger have all come up negative for Brucellosis. Cattle producers in Montana keep dodging the bullet here which I am glad to see. I would like to point out how flexible the definition of good news can be. Karen reports as good news, her cattle tested negative for Brucellosis in this testing around Bridger but since all her two year old heifers were spending some time at the originally infected place, they are considering exposed and all the heifers and their calves will be killed. Real "good news" isn't it? Lose over 30 pairs, get no compensation for them, and have to pay for the Brucellosis testing to boot and call it "good news". Isn't our government and the policies they foster great. UPDATE: Karen has set me straight. They are getting paid for testing and are offered a cash payment for the slaughtered cattle which they can accept or not. Whether it is worth the value of the animals is irrelevant. It doesn't change the fact that Karen has a strange definition of "good news." I don't know that I could handle such "good new" as well. FYI-The owners are paid for the cattle and the testing is paid for by the state and federal governments. Karen has been told by the federal and state authorities that there is no policy for compensation and that they are more than likely not to receive any. She ought to know, she is in the center of this storm. Hmmm - when did I say that? The testing is being paid for by taxpayer dollars. I am including myself in "taxpayer". The herd will be sent to slaughter as per federal rules. We have not yet been told what we will be paid for them. When they finish their appraisal we can accept it or repeal it. But troubleshooter - it isn't as simple as "the owners are paid for the cattle." How do you put a price on a heifer who has should have had several more productive years and calves? What kind of money do you think a calf that will be weaned this early will bring? Here we are told that brucellosis is costly, contagious, and serious. All of the positive cattle were vaccinated. How effective is this vaccine? Maybe 65%. Why are cattle producers paying our vets for a vaccine that doesn't work? I'd rather pay for research on a better vaccine. If all the healthy - yes, they are healthy - but exposed cattle are required to be slaughtered per USDA rules - why are the exposed bison hazed back into Yellowstone? Isn't that risking any healthy animals that haven't been exposed? Just how contagious is this disease? It obviously is deemed more serious in our livestock than our wildlife. Keep in mind that the six positive cows have calves on them. Those cows did not abort or have weak calves. It is NOT good news - and the other day's front page Gazette headline "Worst Brucellosis Fears Unrealized" was very misleading. The Morgan's are losing their entire herd. I am losing my heifer herd. My cattle at home are negative. As far as the way I am handling the news - Sam, I don't have much of a choice. That's the worst part - it is completely out of our hands. I have been through more than my share of horrible things these last few years - and some are still ongoing. But you know what - I refuse to throw my hands up in the air & surrender. 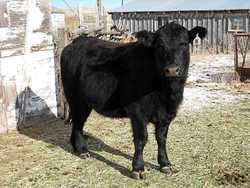 This is one of the best looking Two-year old heifers in the bunch. I really liked the looks of her. She's belongs to my oldest daughter. I hope I can talk her out of any heifer calves on her, she has too god of genes to waste. Taken 1/30/2007.